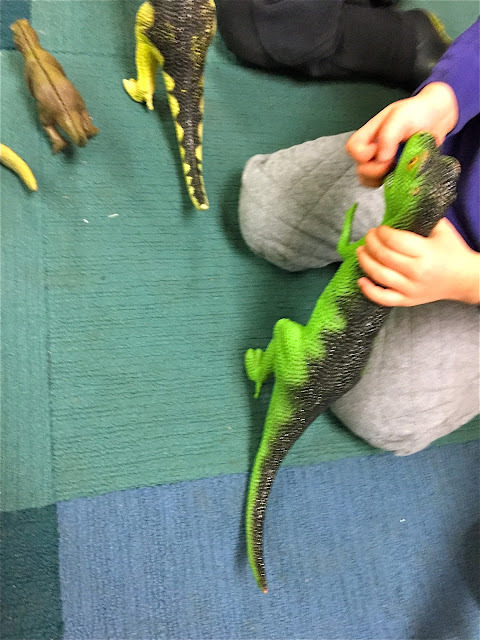 Teacher Tom: "Maybe That's How Dinosaurs Got Extinct"
I was sitting in a circle of three-year-olds playing with our classroom dinosaurs. There was, as usual, a lot of roaring and a lot of talk about who was going to eat whom. There are always one or two dinosaur experts in every Woodland Park class and as we roared we debated which were plant eaters and which were meat eaters. Those with some knowledge insisted that we stick to the science while others advocated for pretending whatever they wanted. It got a bit heated, punctuated by attacking T-Rexes, which were being fended off by spiky tails, spines, and heads. At one point, a T-Rex predator said, "I'm going to make your dinosaur extinct!" The prospective prey replied while swinging a tail at his tormentor, "You can't make me extinct! Only space rocks can make me extinct!" There were plastic dinosaurs being pushed into everyone's faces and lots of roaring. I was watching the children's faces for signs of distress. I just assumed that this would end with someone in tears and was looking for an opportunity to naturally draw attention to that possibility with something like, "Rina's face looks worried," but the opportunity didn't present itself because the kids paused on their own, focusing on the more interesting verbal parry and thrust. "Space rocks don't make dinosaurs extinct! Volcanos make them extinct!" Another player chimed in with, "Dinosaurs turned into birds," a comment that drew long confused stares from the primary combatants, who, not knowing what to do with this information, turned back upon one another. "A space rock is called an asteroid and they fell from outer space and crashed the dinosaurs extinct. That's really how it happened." He considered this and seemed to find it at least partially convincing. Shrugging, a T-Rex in each hand, he replied, "Well, there were volcanos too." The debate had brought several of the kids to their feet, but with this concession everyone settled back on their knees. Changing the subject, one of them picked up a smaller scale dinosaur and shoved it into his T-Rex's mouth. "I'm eating a baby dinosaur." They all did is for awhile, eating baby dinosaurs, meat eaters and plant eaters alike. Then Rina said, "I'm eating my own baby!" "Me too! I'm eating my own baby!" And there was a mad scramble to find "babies" that corresponded to the larger scale "adults" they held in their hands: Triceratops mommies eating Triceratops babies. Stegosaurus daddies eating Stegosaurus babies. A boy stood outside the circle, watching the infanticide. "You're eating your own babies? Maybe that's how dinosaurs got extinct." It was one of those comments like the one about dinosaurs evolving into birds that caused everyone to pause a moment. As one, they removed the babies from the mouths of the larger dinosaurs. But it was only a momentary lull as one meat eater then turned on another, "My T-Rex is going to eat another T-Rex," and we carried on.